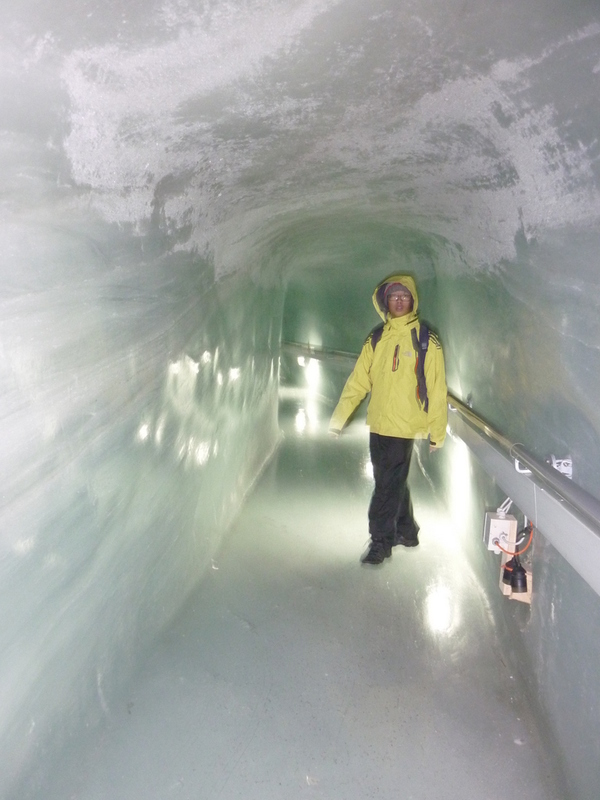 The scenery abruptly disappeared into a tunnel and then there were two more stops until I could get to the summit of the 3’500 metre Jungfrau, its the highest mountain in Europe, actually there are mountains that 4’000+ its just this one you can visit publicly without any climbing equipment. 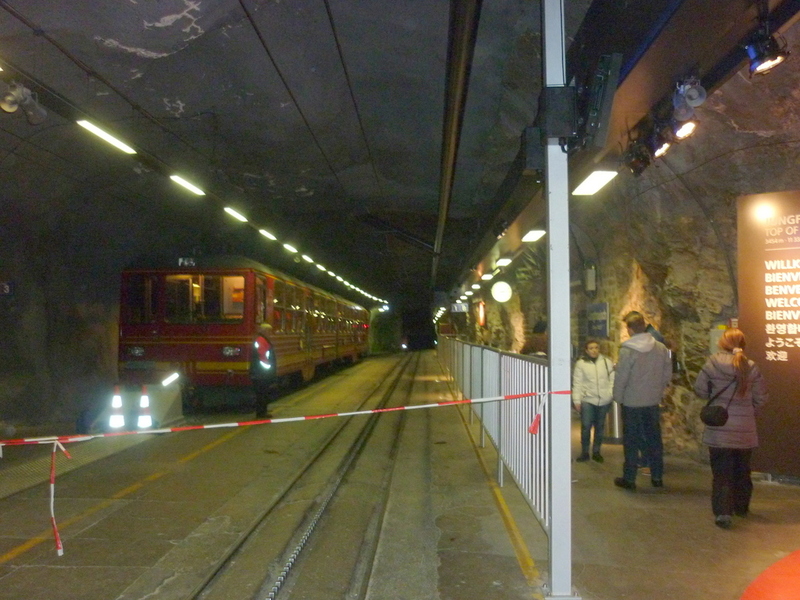 The two short stops are more like the halts you get when a train stops at a signal, we got out each stop for about five minutes and there is a glass window in the tunnel where you can see over at the mountains, I didn’t get any pictures of this, as the glass was dirty and pictures wouldn’t look that great. Outside on this side is the ‘Sphynx’ a seperate peak with its weather station and outside platform – I guess the shape of the cliff face is a tiny bit similar to the Egypt statues of the same name. 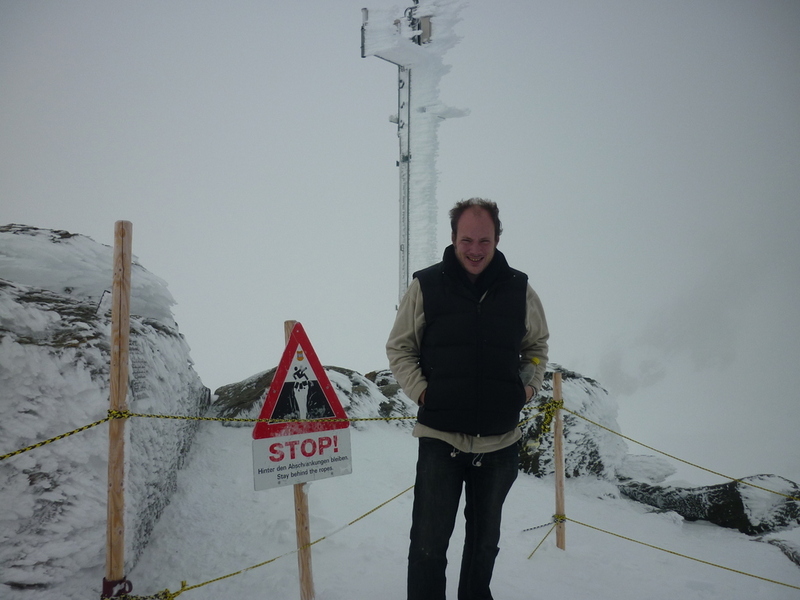 Out here is a weather station, and the main look out post, which you can see…. er, not a lot. 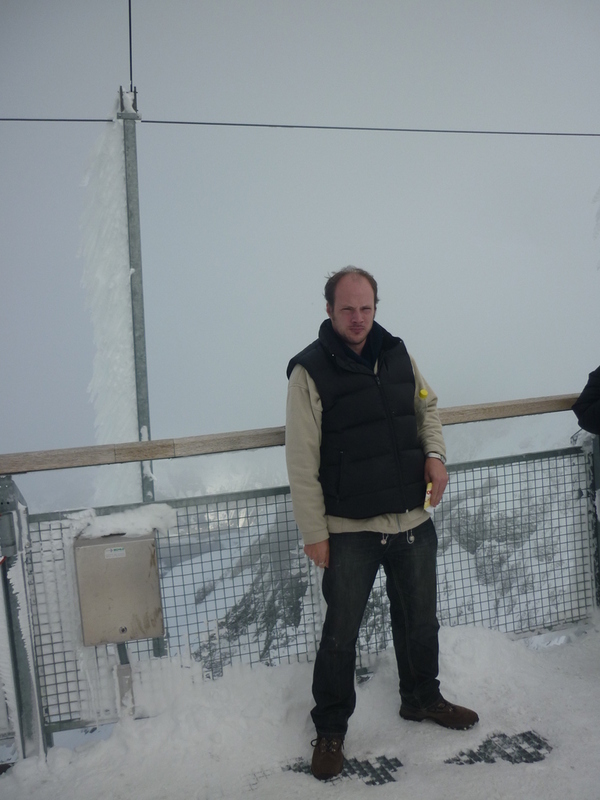 sky, clouds and snow, and not a lot to differentiate them. When I came back to this part a little bit later you can now make out the valley tha’ts in between the different peaks. 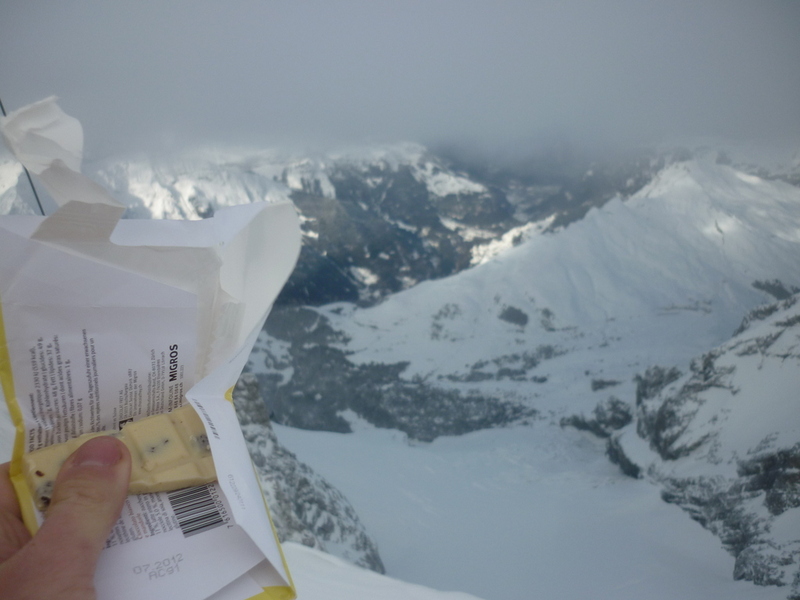 Some very pleasant white Swiss chocolate against the mountain backdrop. 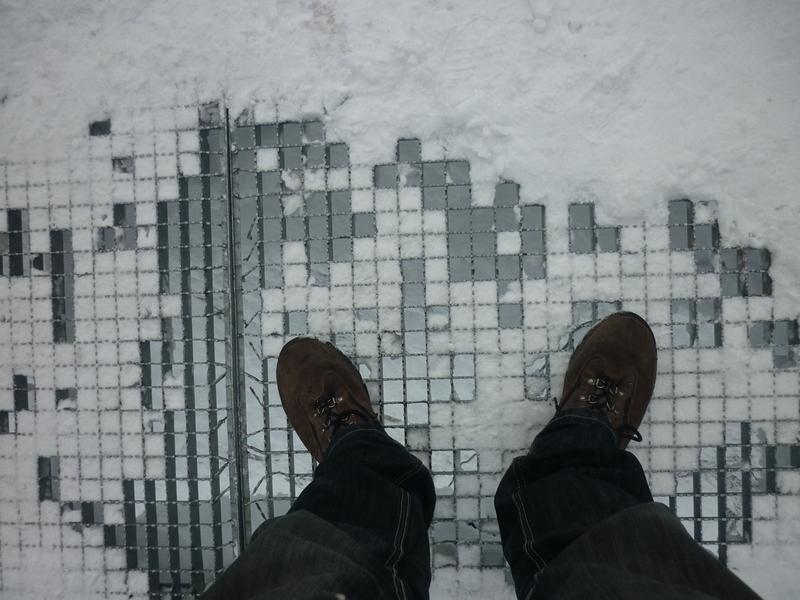 No, this isn’t some crossword or soduko game, there is a long drop below the metal grid platform I was standing on, which has partially filled up with snow. 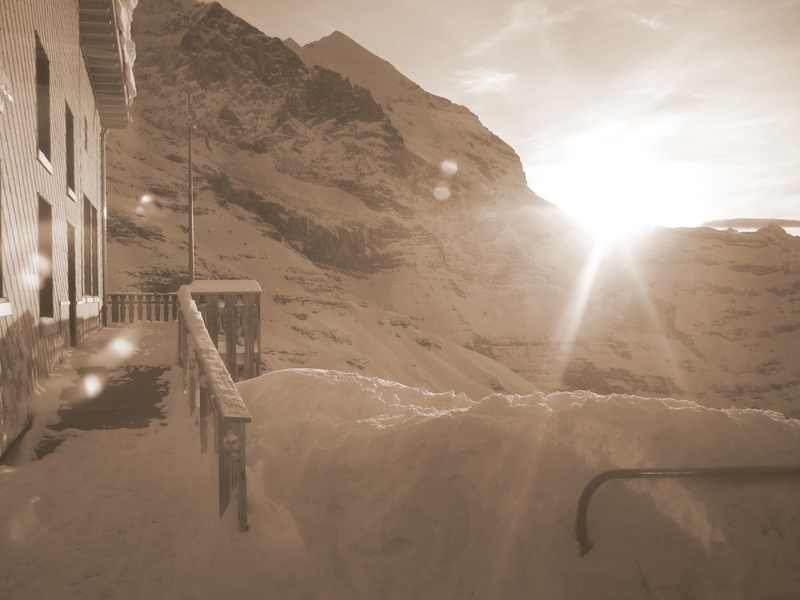 Above is facing the other direction, here more exposed to the elements, the weather is something in the region of 16 degrees below zero. 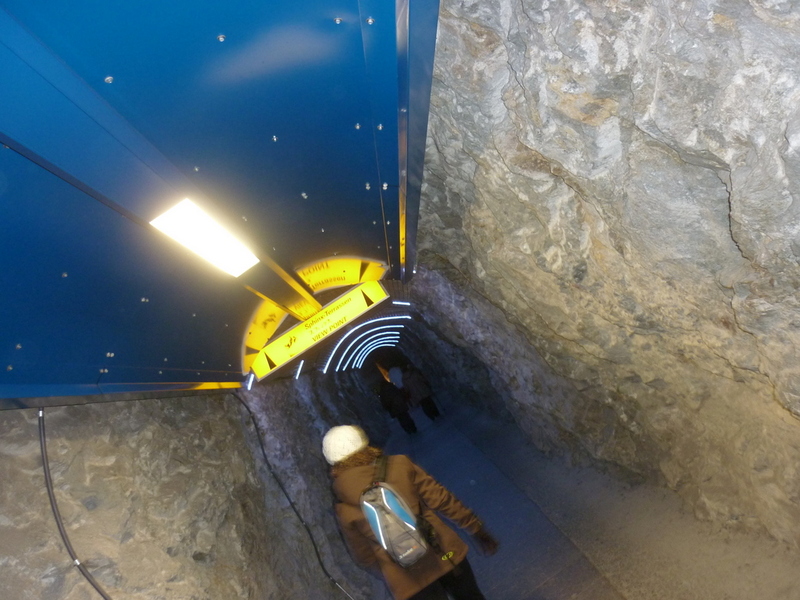 There is a lift that takes you between the middle of the complex, I think its roughly the vertical distance of 10 storey building which takes you to the shops and restaurants. There is a film where you can watch the history of this place and how the line was built, but I was disappointed I wasn’t able to see this at was booked for group. 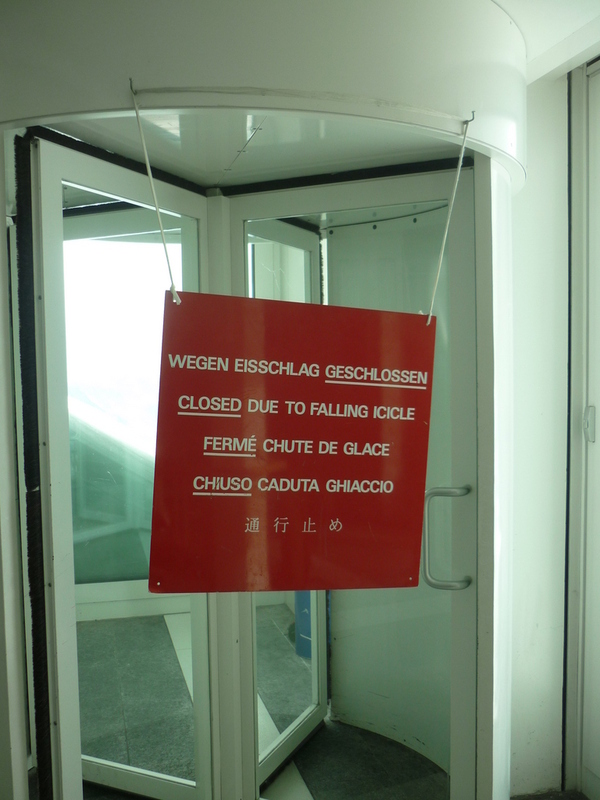 Later on, I headed back towards Interlaken, actually mistakenly taking a slightly different route back. 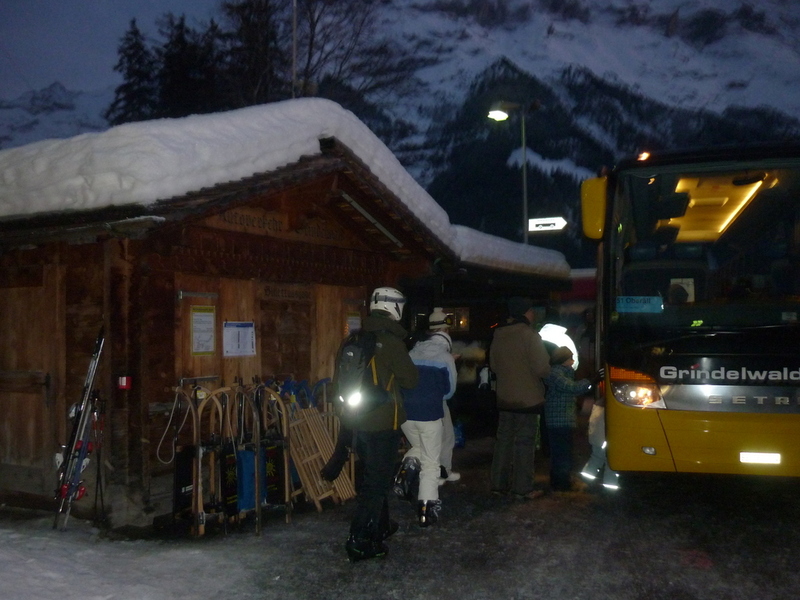 Actually this was a pleasant discovery, this small town, I am not sure of the name of, is so charming even the bus stop has a wooden chalet to wait in. 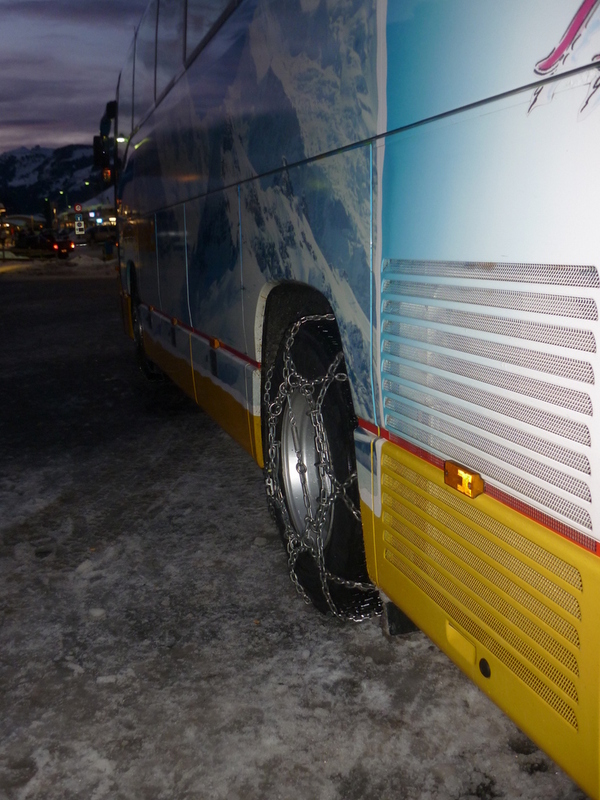 The buses look suitably robust enough to deal with the snow with these chains. 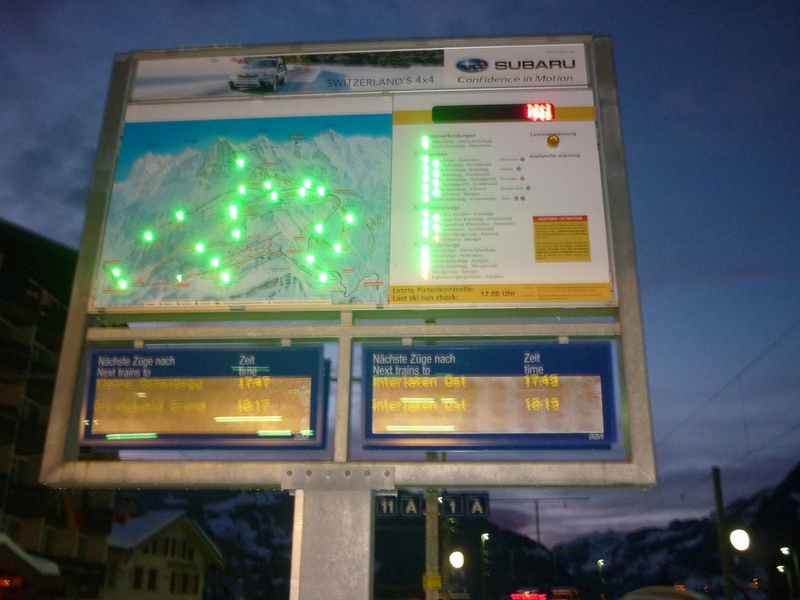 The sign above gives visitors to the slopes a heads up of the weather conditions and what is safe to visit. Was this worth the money? 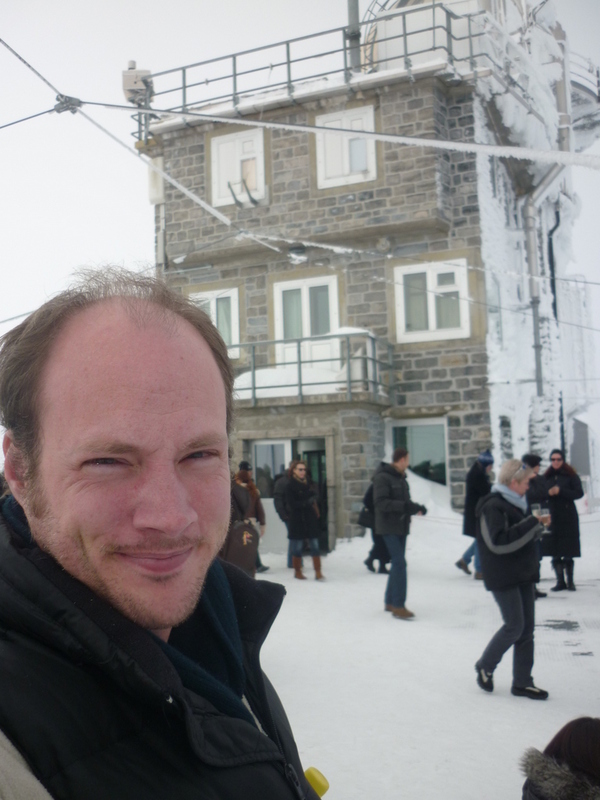 probably not, it was great to say I can visited the highest publicly accessible peak in Europe, but due to the huge cost of getting there, and several of the promised places were shut (not just weather but engineering works) but I am glad I got to do this journey.